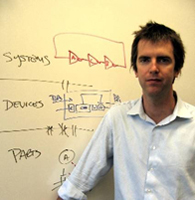 DREW ENDY is Assistant Professor of Biological Engineering at MIT, where he is working to enable the design and construction of large scale integrated biological systems, and to develop and improve general methods for representing cellular behavior. One of the early promoters of open source biology, Endy helped start the Biobricks Foundation, a not-for-profit organization that will work to support open-source biology. He is also a co-founder of Codon Devices, a biotechnology startup company that is aiming to commercialize DNA synthesis.